Yep, thanks Marlon. I look forward to reading it on paper too. Anazing that the little stems stay upright, given that they have all those heavy fruits one one side. 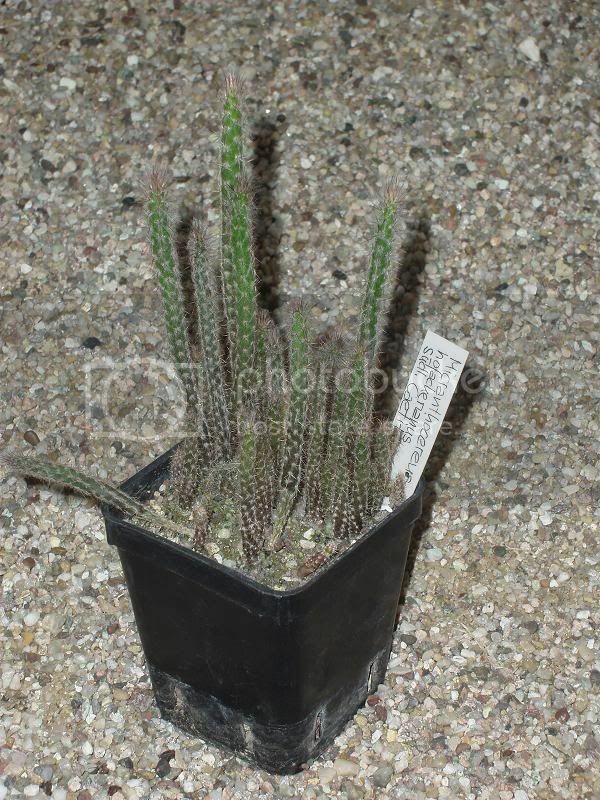 This is another difference from Arrojadoa species from the A. dinae group, where the plants do not have woody stems, or they are woody only at the base near the soil. These plants do not grow stems as long as those of M. hofackerianus, or if they do they need to lean on the surrounding vegetation to stay upright. Institute for Systematic Botany, University of Zurich, Zollikerstrasse 107, CH-8008 Zurich, Switzerland. Is anything being done to educate the locals and protect the plants in habitat? And is the plant in cultivation? Maybe Society members could help by growing seeds etc. Member of Somerset branch. I have a diverse mixture of small cacti plus a few larger survivors from a previous collection. I also like Stapeliads, Titanopsis, Anacampseros, and various other succulents. Now proud owner of many self-raised seedlings. No, at the moment nothing has been done to protect this plant in its habitat. When I return to Brazil I plan to explore the region where this species occur in order to try to locate other populations. I must say that Google Earth makes it a lot easier to pinpoint other areas likely to also have this species. 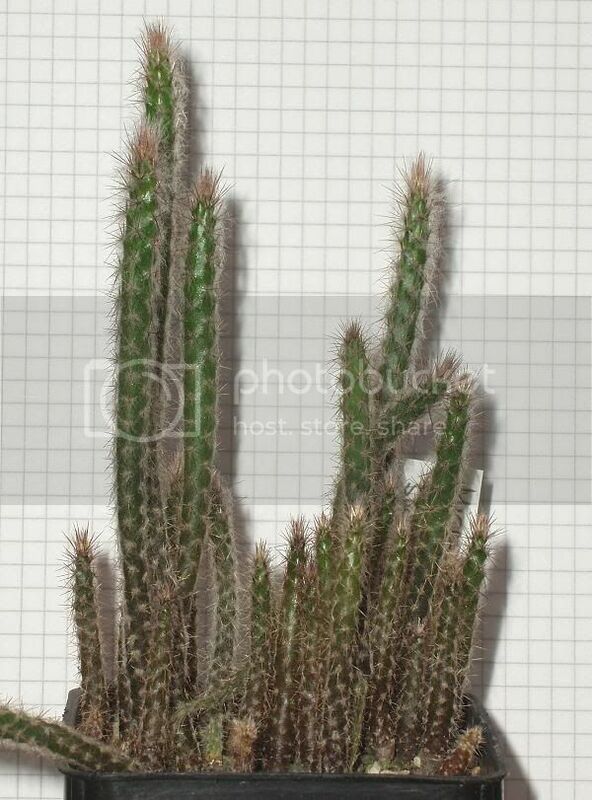 Micranthocereus hofackerianus is in cultivation, but is not very common - I know just a few people that have it, including the people that originally found the plant. When I visited the habitat of this species at the beginning of 2006 to collect material for study, I also collected some seeds and I sent these seeds to a few people that could propagate this plant. Habitat destruction is a very sad thing, but it something rather difficult to control or avoid because after all mankind have their needs and change its environment in order to satisfy these needs. However in this process we obliterate many of the species that previously lived in the habitats that we transform to attend to our needs. I wonder how many plant and animal species have been destroyed before we even knew they existed. Yes, it's very sad to think. But, I am sure that lots of us here would be happy to grow the plants until they are big enough to be reintroduced. I'd prefer to stick to less endangered plants, though... I'd hate to kill any from lack of experience or equipment. I guess thin stems adapt by being stronger. I am trying to encourage my little Opuntia sticks to grow more roots by brushing over them to simulate wind - from the same principle as trees at the middle of the forest being the ones to fall in high winds. I don't know if that really works. Micranthocereus hofackerianus seedlings. Photo: Marlon Machado. The biggest seedlings are about seven centimeters tall. Here are the same seedlings with grid paper as the background (each square in the grid is 4x4 millimetres). 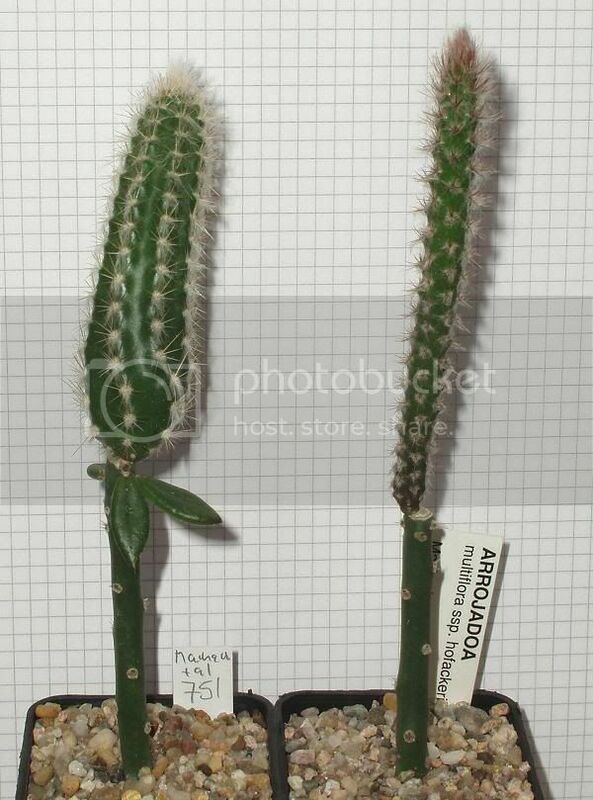 Seedlings of Arrojadoa dinae (left) and Micranthocereus hofackerianus (right). Photo: Marlon Machado. How old are the seedlings, they look pretty vigorous and obviously germination rates are high. I need to check with Cyrill the exact dates, but I believe these seedlings are from seed he sowed this last spring - the seedlings are less than a year old.